The zombie apocalypse trope has been exploited considerably in the video game medium since the industry first became widespread in the late early ‘80s. There is just something about this setting that always grabs our attention: The struggle for survival, the tenacity to adapt to a world where humanity is nearly extinct, and the relationships between the few survivors that work together to live through another day. Last Day on Earth is a game centered around this very same concept. However, in contrast to other zombie games like Left to Survive, or The Walking Dead: Road to Survival, Last Day on Earth focuses more on the survival aspect over the elements of combat, and its gameplay revolves around gathering resources and building your encampment. Furthermore, it also has many “sandbox” elements through which you must manage and expand your base camp by learning new crafting recipes to create furniture, walls, and other useful artifacts. 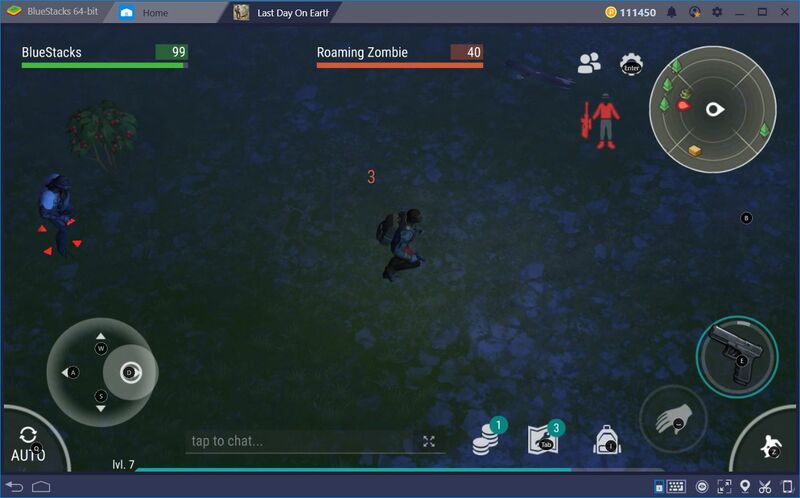 Nevertheless, to achieve your objective, you will have to run around in search for materials, while also taking out any zombies and hostile players that you come across to gain experience, learn new recipes, and increase your odds of survival. 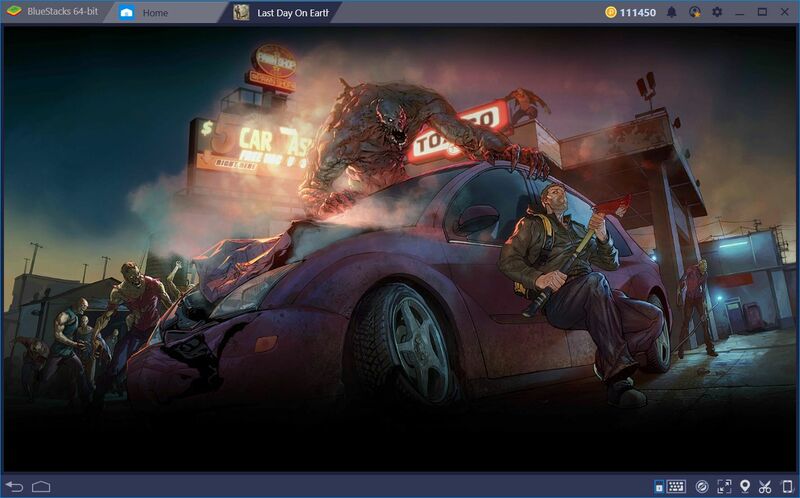 Luckily, when it comes to surviving a zombie apocalypse, BlueStacks grants you the Keymapping tool, which you can use to increase your control over the game and to simplify its most tedious aspects. In this sense, you can forget about those clunky aspects, and focus exclusively on the best parts of the game: the survival. Last Day on Earth is a game that is played from an isometric perspective; all the elements of this game are viewed from an elevated angle. In order to move around the different zones, you must drag your cursor around the left side of the screen to interact with the digital joystick. 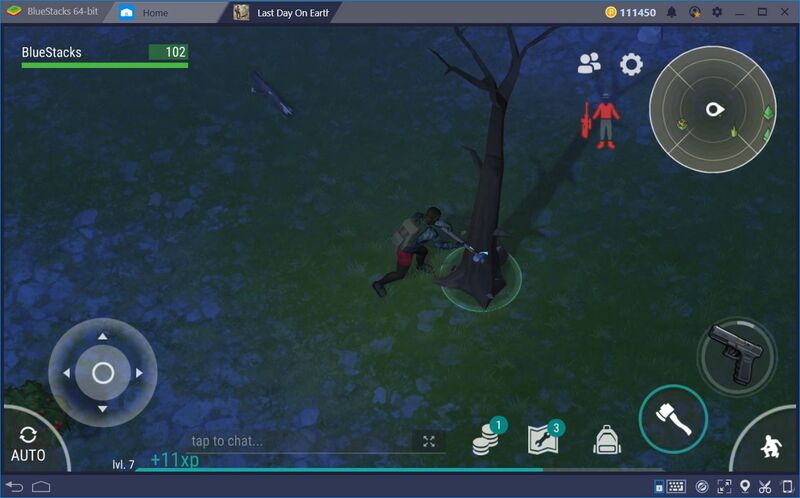 Furthermore, you will find several buttons on the right side of the screen, which are used to control your character’s actions such as chopping down trees, picking up items, mining minerals, accessing your inventory, as well as your blueprints menu, among others. This control scheme is serviceable, but it can cause newcomers to struggle, especially when you are required to open the inventory in the midst of battle. 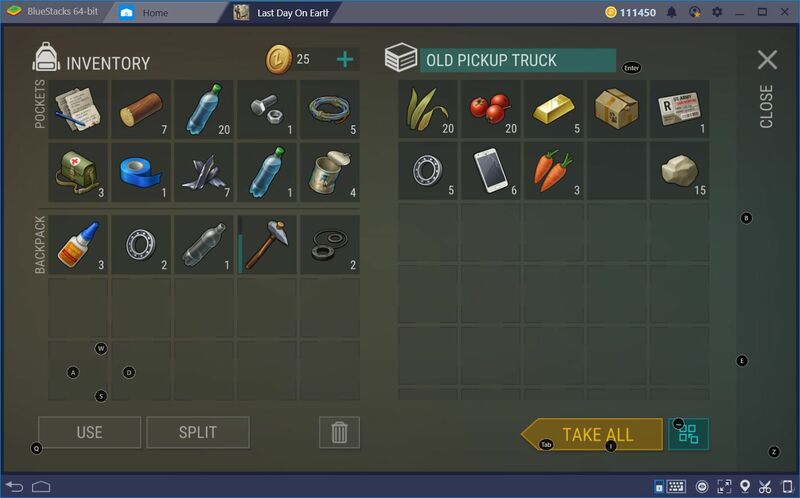 Play Last Day on Earth: Survival on BlueStacks 4 Now! 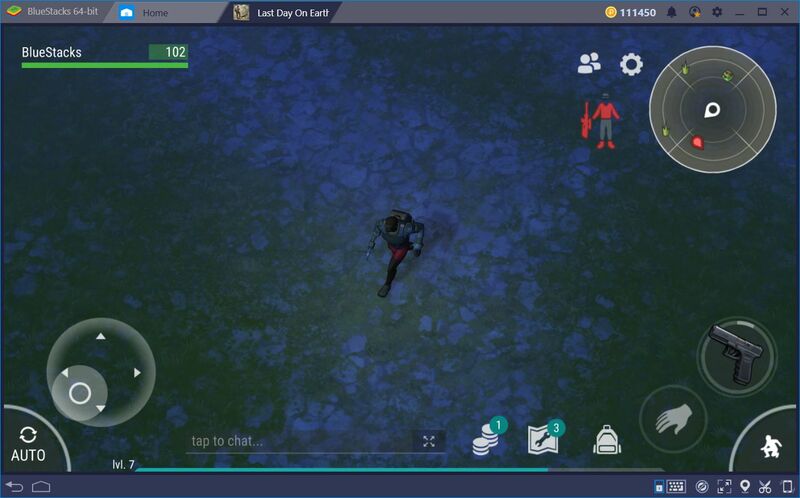 The BlueStacks key mapping Tool is a tool that allows you to create intuitive control schemes for any game by assigning shortcuts anywhere on the screen and binding the said shortcuts to any button on your mouse or keyboard. For games like this one, this implies that your reaction speed and capacity to execute complex strategies will increase considerably since you won’t have to struggle with the controls, nor try to click on small buttons in the middle of combat as these will be bound to your keyboard. 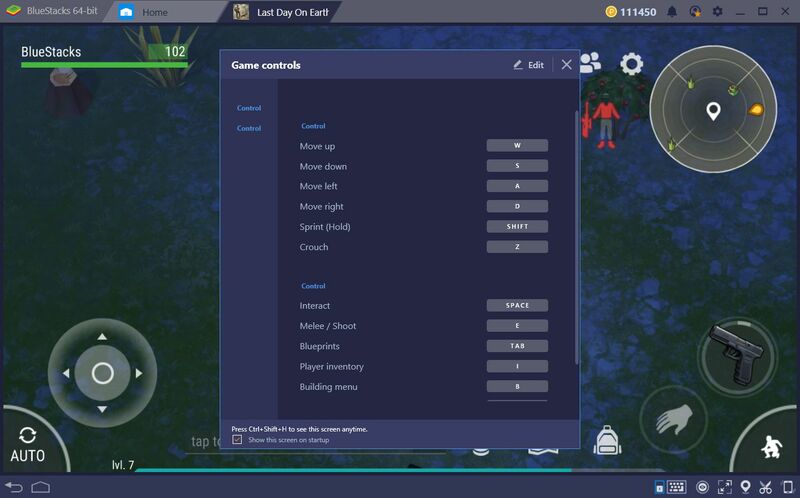 This is the default control scheme created by our team of developers according to what, in our experience, was the most comfortable way to enjoy this game. However, you’re free to customize it in any way you see fit. By clicking on the keyboard icon located in the lower right part of your screen, you will open the key mapping menu. When you click on “edit,” you can modify these bindings to your will. However, this is not the only thing you can do with the keymapping tool. If you feel that there’s a shortcut missing from the predefined scheme, or that there are certain features that can’t be accessed with your keyboard, you can click on “advanced options” to open the menu that will let you assign new shortcuts anywhere on the screen. In this screen, you can choose from a series of predefined functions and drop them on the screen to create your own custom shortcuts. Kiting: A term used to refer to the act of attacking while moving around, which dramatically increases your combat prowess in relation to mobile gamers who have to stop every time they need to attack. With BlueStacks, you can “kite” your enemies and employ hit-and-run tactics to eliminate your foes without suffering a single scratch. Multitasking: When playing on mobiles, you frequently need to focus on one task at a time to do them right. However, the keymapping tool allows you to tackle several tasks at a time since you can access many features with your keyboard. In this sense, you will dedicate your cursor solely for precision tasks such as designating targets, while using your keyboard for more general-purpose tasks such as interacting with your environment and moving around. 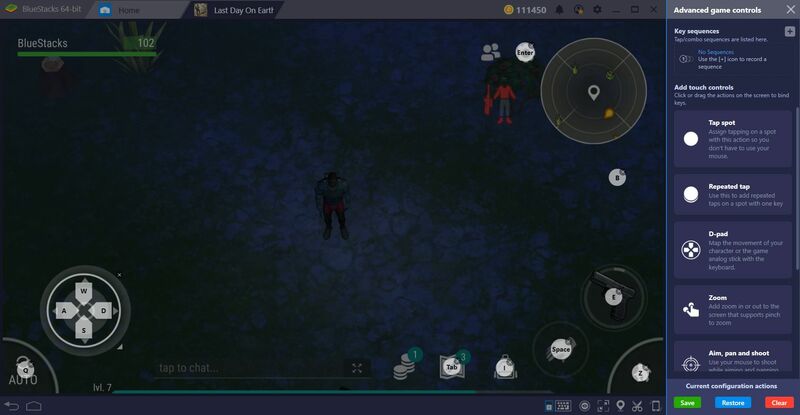 Some of the most important tasks that are simplified through this feature are accessing the inventory to heal yourself in the middle of combat, switching weapons during intense fights, or to quickly sort your inventory while playing in automatic mode. And we haven’t even mentioned the comfort that the keymapping tool provides when erecting buildings or crafting new stuff. With this tool, you can browse through all the menus and create new items using only your keyboard, as well as positioning all your new buildings using your mouse, and with the ease that you expect from any RTS game for PC. 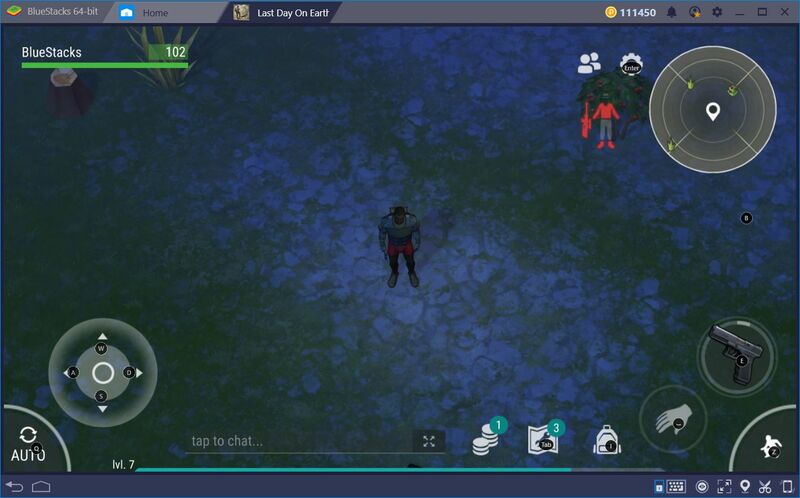 As you may have noticed, the BlueStacks Keymapping Tool is an essential feature for playing Last Day on Earth. How has this tool helped you in your quest for survival? Share your suggestions in the comments section below and help your fellow gamers to survive in this game!